Hed kone are equivalent to truffles in their prestige, price and rarity. You may have money but you need both the money and the connections to get the best or any hed kone at all. Hed kone only grow wild, usually near termite mounds. We used to have a few growing near a termite mound next to our house. But they stopped growing when my parents decided to do some pest controlling. I was lucky to visit Thailand last September when it rained hard and was very hot and humid; ripe conditions for these delicacies to pop up. My parents' job takes them to remote towns where locals collect these mushrooms for sale. A local woman told us that when it is hot and humid, the mushroom collectors know it is time to go hunting. They would go into the woods around midnight looking for the white reflection of the mushroom from their flashlight. There is such an excessive demand that the collectors frequently sell an entire year's findings in advance of the mushroom season. This year my mother bought some directly from a collector at 200 baht a kilo. For a comparison, pork would cost you 85 baht a kilo at the market. A driver can make 400 baht in a day. 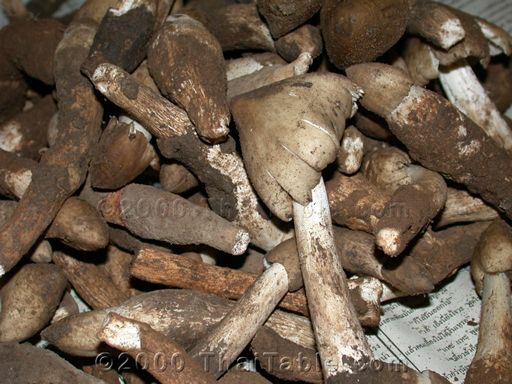 By the time the mushrooms reach Bangkok, they will fetch 400 baht per kilo, if you can find them. At a fancy restaurant, a small dish can cost you 400-500 baht. Thai agricultural researchers have tried unsuccessfully for years to cultivate this variety of mushrooms. The best way to prepare this mushroom is grilling. The juice is so sweet, the flavor is earthy and the texture is crunchy but meaty. Another common way to prepare hed kone is in tom yum hed kone. My mother also prepared noodles in gravy with mushroom. I don't believe that they are available in the US fresh. You will be lucky to find them in cans or bottles. If you ever get a chance to have the fresh ones, splurge. Hed kone may not get the international recognition like truffles, chanterelles or morels, but for me, hed kone are the best mushrooms I ever had. Unlike most western mushrooms, the flavor stands on its own.